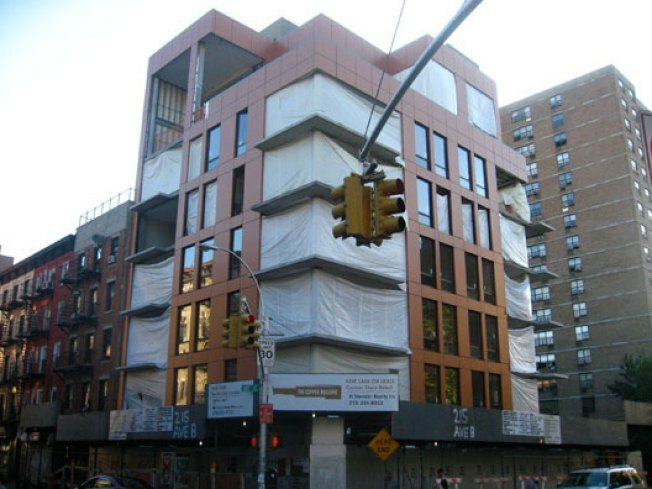 Judging by the pace of construction, the East Village's Copper Building at 13th Street and Avenue B is in no hurry to get done before those alleged green shoots can bloom. But that doesn't mean there hasn't been any progress on this former Development Du Jour. The 17-unit condo building is currently getting glassed, although that's not the headline here. Some fresh renderings have been added to the Copper Building's Elliman listings (here's one), and the project has managed to succeed where urban planners, architecture enthusiasts and probably even Tishman Speyer have only dreamed: The Copper Building has made Stuyvesant Town disappear. In the ultimate insult, the rendering retains the housing project while replacing Stuy Town with, uh, an office tower parachuted in from downtown Dallas? There's also an interesting interpretation of Avenue B, as well as what appears to be a whiff of the Edge high-rise across the East River on the Williamsburg waterfront. Issues of geography aside, that would at least make a bit of sense seeing as how Copper Building architect Stephen B. Jacobs also designed the Edge complex. So what's his beef with Stuy Town? Did Stevie get caught in the net?